celebrating community of honor and grace. Family by God’s Design delves into the Biblical basis of the intentional Christian family and offers practical suggestions to help your family become a celebrating communities of honor and grace. Family By God’s Design is divided into three sections. Section one focuses on practical ways to show honor in your family. Your family will be encouraged to treat one another as precious by using speech that honors, keeping one another “in mind,” and accepting one another’s influence. Families will even learn how to remain honorable in the midst of conflict and discipline. Family By God’s Design will provide practical ways to share grace with your family members in section two. Specifically, family members will be encouraged to become grace-receivers, giving unconditional acceptance and sharing the currency of grace with one another. You will also learn how to “give yourself up” for one another without becoming a doormat and the steps of forgiveness in this section. 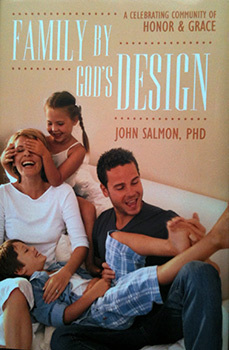 The final section of Family By God’s Design focuses on celebration in the family. Chapters in this section will help you develop a Biblical perspective on playfulness and celebration, offer suggestions for implementing rituals of celebration, explore the celebration of marital intimacy, and discuss the importance of discipline for celebration. Dr. Salmon has done a wonderful job of surveying much of the relevant material available in reference to marriage and family. Beginning with the introduction, there are numerous analogies and metaphors to help the reader grasp his ideas. Throughout Family By God’s Design, he introduces information from the best authors today to assist the reader in understanding how a healthy God-honoring family operates. You clearly see his belief in the importance of marriage and family as a part of God’s design. Family by God’s Design offers an excellent resource to help the families in your congregation become celebrating communities of honor and grace. You can use Family By God’s Design several ways in your congregation. Family By God’s Design could serve as a premarital resource. Couples could read this book to prepare for marriage and use the topics as a conversation starter with the pastor. Family By God’s Design also offers an excellent resource for small group studies focused on family and how to create a family that can reflect the image of God. Family By God’s Design also offers an excellent resource for those preparing to have children. parents could read it individually or study it in small group setting to gain practical advice for shaping a growing family based on God’s design.